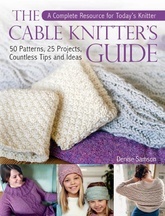 Cables are fun to knit - but if you've never worked one before, it's hard to know where to start! The Cable Knitter's Guide is divided into two parts: The first introduces 50 elegant variations on the basic cable, from the elegantly simple to the eye-catchingly complex, all accompanied by detailed photographs, diagrams, and step-by-step instructions. Novices in need of even more guidance can follow the links provided in the book to a series of videos of the author herself demonstrating how to work each cable included! The second section forms a collection of 25 patterns for garments, accessories, and furnishings, each using one or more of the cables introduced earlier to add a little something extra to these delightful designs. Denise Samson is an author, translator and designer. She has had patterns published in Norwegian magazines and has taught various knitting and crochet classes. She lives in Oslo, Norway.